We often describe Dartmoor as holding a rugged beauty and for the most part that remains true and helps us appreciate the harshness of some of the environment. Every now and again Dartmoor offers something new to the eye, something unexpected, perhaps only for a short period in time, just like these crystal clear emerald-tinged pools. 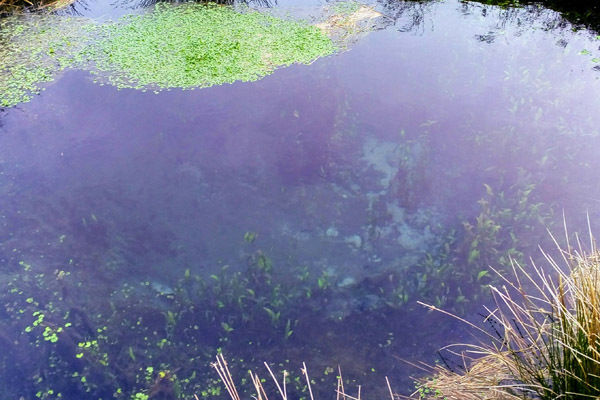 This pool found at Holne Moor SX 675698 is approximately one metre deep and is alive with flora found in only the healthiest of wild water features. 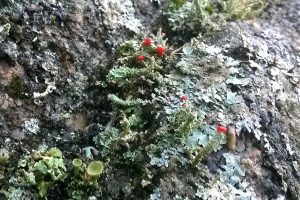 It is in an old tinning excavation and continuously fed with fresh water from the moor it has managed to avoid becoming peat-stained. This entry was posted in Flora, Mining on 21st December 2018 by kiwinutz. The Sundew plant Drosera Rotundifolia feeds on insects that have been attracted to the glistening drops of mucilage on its spiney red leaves. The droplets covering the leaves are loaded with a sugary substance however the stickiness is overwhelming for the small insects it attracts. Enzymes dissolve the insects in situ and nutrients are obsorbed into the foliage. 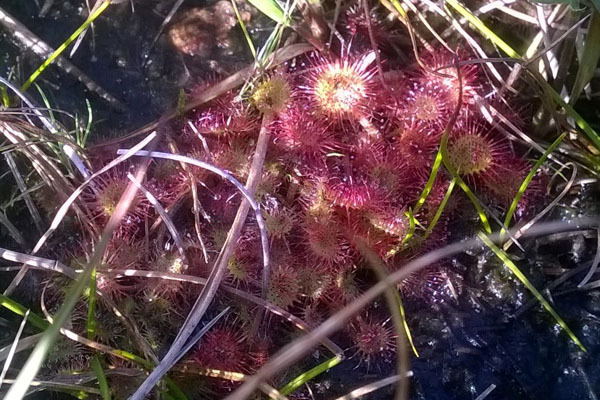 Sundew have developed their carnivorous behaviour to substitute for the lack of nutrients of their chosen environment, namely damp acidic soil, marshes and blanket bogs. The insects provide the necessary nitrogen and other nutrients missing from such soils. This example was found close to a tributary of the river Walkham on South Dartmoor. This section often floods leaving the area squelchy in all but the driest summers. This entry was posted in Flora on 25th September 2017 by kiwinutz.